“As often as ye eat this bread and drink this cup, ye do show the Lord’s death till He come“. —1 Corinthians 11:26. 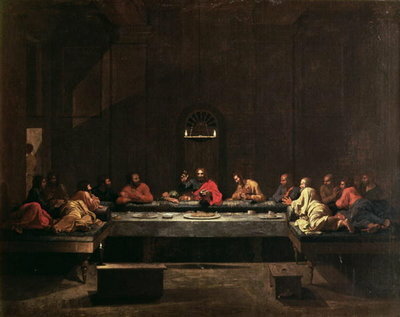 As they were eating, when the paschal meal was about over, Jesus took bread, and blessed it, and broke it, and gave a piece of it to each of His disciples, saying: “Take, eat.” While thus dividing the bread, and as the disciples were eating, He said: “This is my body, which is given for you.” And when all had eaten, He said: “This do in remembrance of me.” After the same manner also He took the cup, gave thanks, and gave it to the disciple sitting nearest to Him, saying: “Drink ye all of it.” And while they all drank, He said: “This is my blood of the new testament, which is shed for many for the remission of sins.” And when all had drunk, He said again: “This do ye as oft as ye drink it, in remembrance of me” (Matthew 26:26-28; Luke 22:19; I Corinthians 11:25). We know that here the Lord Jesus instituted the Holy Communion of the New Testament, which was to take the place of the typifying paschal meal of the Old Testament. And in all Christendom this is to he celebrated to the end of time. In Holy Communion, Jesus, who is the true Lamb of God, under the bread and wine, gives us His body, which was given into death for us, and His blood, which was shed for us. Both the Old and the New Covenants were sealed in blood: the Old Covenant was ratified by the blood of ceremonial sacrifices of bulls and goats, which Moses sprinkled upon both the book of the Law and the people; the New Covenant is ratified by the blood of the better sacrifice of God’s own Son, which is sprinkled upon us by the work of the Holy Ghost through the Gospel (Hebrews 9:18-28; I Peter 1:2). In Holy Communion the Lamb of God, that taketh away the sin of the world, gets into the closest possible communion with us: we receive His body and blood, and with it the forgiveness of sins, life, and salvation. Here we must, in true faith, joyously hail our Savior, remember His salutary death, and proclaim, by an open profession, His death by virtue of which we have been redeemed. Ah, how much do we love Him, who, in the fullness of time, came to suffer and to die for us! PRAYER – O Lamb of God, my Lord Jesus Christ, I thank Thee, that out of Thy great mercy toward me, a poor sinner, Thou hast instituted a supper where I receive the food and drink of eternal life: Thy body, sacrificed for me, and Thy blood, shed for me. Grant that I may often approach this Holy Supper with true hunger and thirst, that I may receive forgiveness of sins, life, and salvation through Thee and from Thee, and, firmly believing, comfort myself with such salvation. And grant me grace, I implore Thee, to adorn such faith with an open profession of Thy blessed name and with a Christian walk, until Thou wilt come to seat me at the tables Thou hast prepared for me in the blissful mansions above. Amen. Lord Jesus Christ, Thou hast prepared a feast for our salvation. as weary souls with sin opprest, we come to Thee for needed rest, for comfort and for pardon. For Thy consoling Supper, Lord, be praised throughout all ages! Preserve it, for, in every place, the world against it rages. Grant that this Sacrament may be, a blessed comfort unto me, when living and when dying.